The heron flies around and eats the poisonous frogs that make the villagers sick. You can also drag child villagers onto the frogs to remove them. You could also pay for the heron's house for $13.98 to make his stay permanent. However, I don't see as many frogs as cracks, so buying the lemur could be more worth the money. 5. How much food is gained from mushrooms, coconuts, crops and fish? Children can forage mushrooms. Each mushroom is worth 8 food. Coconuts, crops and fish give you 12 food. 6. How long before a child is born? 7. What do the technology upgrades for food do? It is important to get your food upgrade to level 2. Level 0 (the basic) only provides coconuts as a food source, which is problematic to allow your village to survive in the long run - you have to upgrade food technology ASAP. Level 1 allows your villagers to do farming. However, the crops are finite, so it can barely sustain the village especially if you plan to expand it. 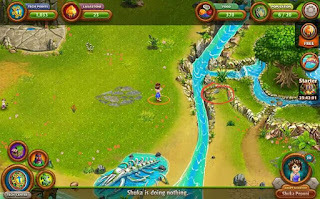 Level 2 presents the possibility of fishing, which is great because Isola seems to have unlimited fish. Level 3 onwards just increases the amount of food you can get from foraging/farming/fishing, so I would not suggest upgrading so soon (I waited forever to upgrade my technology for research first before other technologies). 8. How do I make my villager a master of all skills? Well you could train the villager in every skill and reincarnate him/her after he/she passes on, but what I was was to try my luck and spin the lavastone wheel to get a master villager. Note that you can only do this to one villager, so if he/she passes on, you can't spin the wheel to get a master of all skills to other villagers. As such, you have to reincarnate the master villager. 9. What happens when my fire is out? Sometimes your fire may go out because of random events. When that happens, simply drag an adult villager over the fire and he/she will "check the pit out". Soon after, the fire will be reignited again! Having no fire does not affect the game in any way - people do not get sick more easily. But having fire allows you to collect fire splints, so just light it up! 10. How do I get dried grass? There is a dried grass option to complete a trade on the trading boat for 1600 techpoints. However, there's no dried grass! Stay tuned for the next game update to figure how to get it!